Living in Seattle we are so incredibly fortunate to have wonderful Pacific Rim influences. The cultures are a huge part of our city, and lucky us, so is the cuisine. 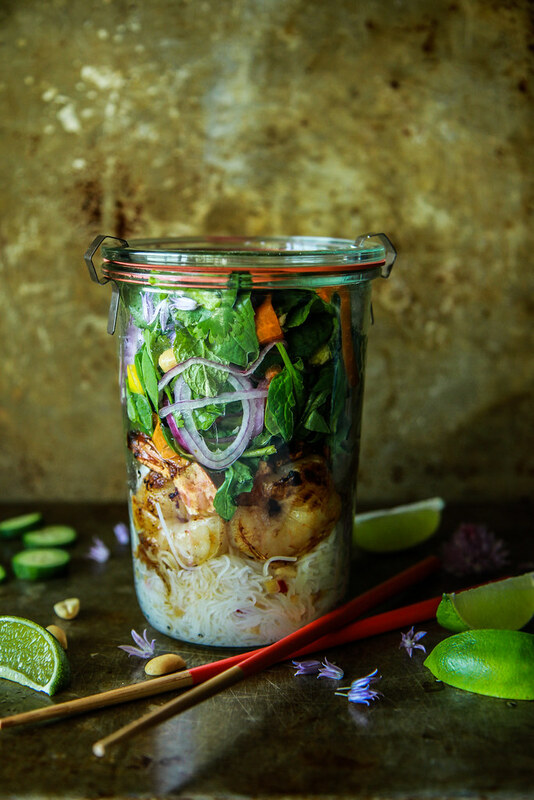 Vietnamese food is one of my favorites and my hubby, kids and I have been on a fairly serious kick recently, frequenting a few of our regular Vietnamese haunts weekly. 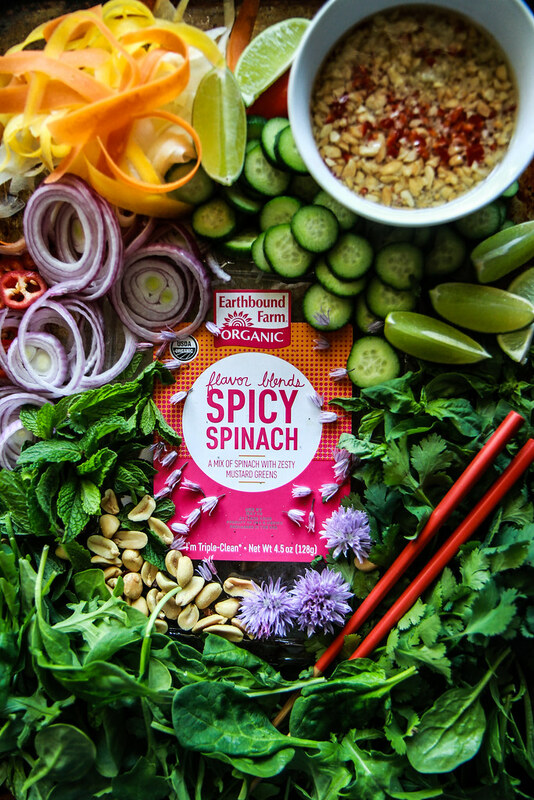 So when I got the opportunity to partner up with Earthbound Farm for National Salad Month, I knew just what direction I would go in- Vietnamese! I am completely obsessed with Vietnamese noodle bowls, and thought it would be amazing to make it more of a salad than a bowl, by adding lots of extra greens and fresh veggies. And when Earthbound Farms asked me what I would do about a “Salad to Go,” I realized that I could take this concept and create a really delicious portable meal to go. By piling the noodles on the bottom of the jar and then adding the shrimp, and finally topping it with salad you make it so that nothing gets soggy and it all holds really well. Plus this is the kind of salad where the greens and herbs getting wilted don’t affect the integrity of the salad at all- in fact it is wonderful even after sitting in the fridge for a day or two. So this is the kind of salad I would make for dinner, knowing that I could then take it to work or on the road with me the next day for an easy (and rather gourmet!) lunch on the go. So definitely give this salad a try this week- dinner, lunch or even for brunch- this salad is so full of flavor and not bad on the eyes either…. 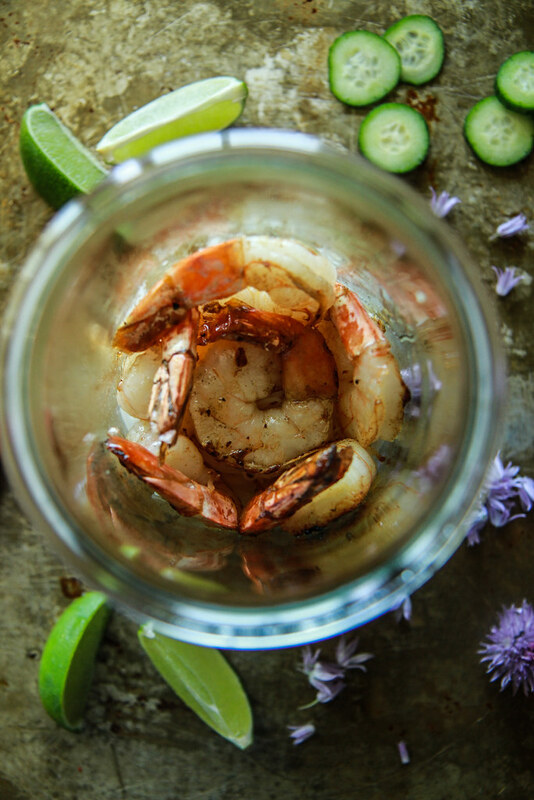 Combine the shrimp, lime juice and a generous sprinkle of kosher salt in a small bowl. Set aside while you make the vinaigrette. In a small pan, combine the sugar and the rice vinegar and bring to a simmer, cooking about 1-2 minutes over low heat until the sugar dissolves. While that is happening combine the chili, garlic and peanuts in a small bowl. Add the fish sauce, lime juice, vegetable oil and then the hot sugar-vinegar mixture to the bowl. Set aside. In the same pan, heat the vegetable oil over medium-high heat. Add the shrimp, a few at a time and cook until golden around the edges and just opaque in the center, about 2 minutes total. Set aside and continue to cook all of the shrimp. Bring a large pot of salted water to a boil and then add the rice sticks. Turn the heat to low and let the noodles sit in the hot water for about 1-2 minutes or until they are loose and all the way opaque. Drain them in a colander and rinse with cold water until they are all the way cool. Combine them in a large bowl with half of the vinaigrette and let them sit. 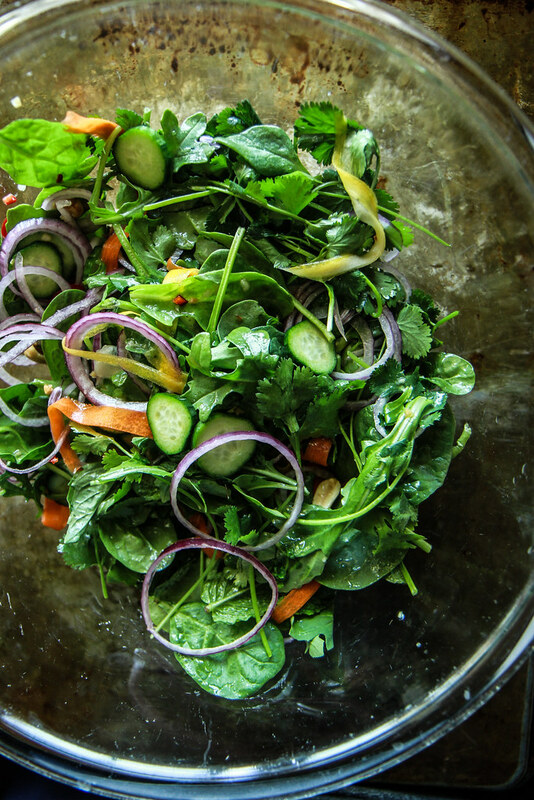 Combine all of the salad ingredients and dress with the remaining vinaigrette. Gently toss everything together and season to taste with kosher salt if desired. I plated this with the noodles on the bottom of the platter and then topped with the salad and shrimp. I garnished with chopped peanuts and chive blossoms. In a large resealable jar, I put noodles on the bottom, then a layer of shrimp, and then the salad on the top. Refrigerate for up to 2 days. I want you to come make my lunches for the week. Yum! ha!! I want someone else to make this for me too! Thanks Denisse! It really is so bright and fresh, I hope you try it! I am always looking for healthy lunch options that I can take with me. This sounds like a great option, especially since my wife doesn’t like shrimp. Thanks for sharing, PINNED!! Perfect! Or you could always sub shredded chicken in or just go all veggies! Oh, I totally adore this noodle salad! The flavors sound incredible! 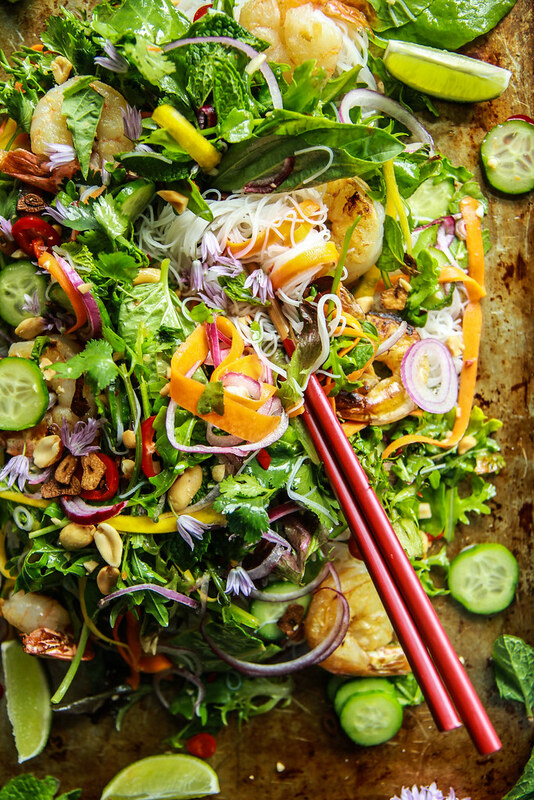 What a fantastic noodle salad! So colorful! Need! What a deliciously fresh salad! I’m so obsessed with rice noodles and these flavors right now! This salad looks gorgeous! 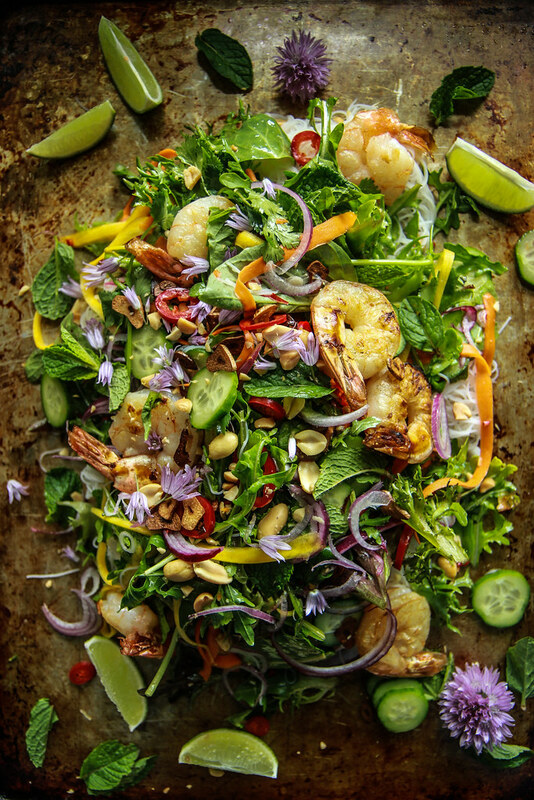 This is one of the prettiest salads ever! I’m all about the vibrant colors and these flavors are killer! This salad is a darn piece of ART!!! Made this for supper tonight. It was fantastic!